During the Sustainability Course we visited the the Intervale Center here in Burlington. Pictured above is Dr. Tom Hudspeth, a professor of Environmental Studies at the University of Vermont. The university is supporting the work of the Intervale Center. 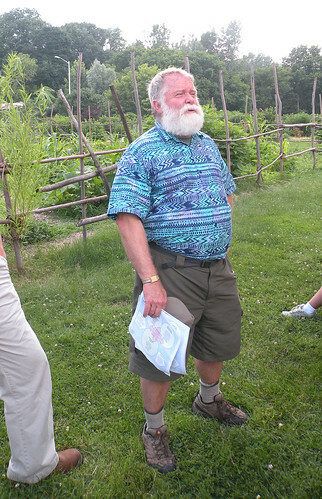 Intervale basically trains and financially helps people get into organic farming. Many UVM students have moved into organic farming as a career. They also are into river habitat restoration and they also have a community gardening. Nadia and I were very influenced by Michael Pollan’s book, The Omnivore’s Dilemma and he featured the farm and farms like that in his book. It is part of a larger movement to bring back small farms and move away from the large agro-business model of fruits and veggies that supply the big supermarket chains. When Burlington’s big supermarket left a few years ago, they were able to form a cooperative market that is now the envy of the high-end supermarkets, all Burlington-owned and operated. 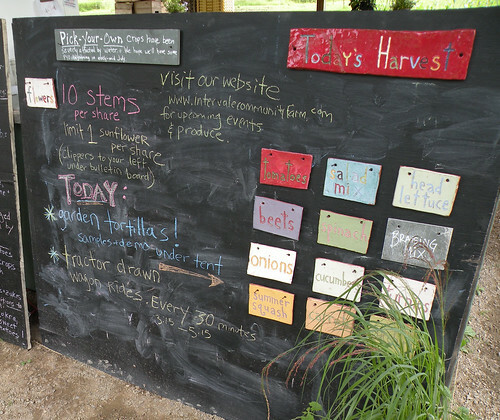 I loved the idea of the community garden where people can buy shares or rent plots to use. They then have access to the weekly market. It is a slow food movement which of knowing where your food comes from. We had some long discussions on the viability of farming as a career. I like to see small farming coming back.